The Model Millionaire (1887) is the story about what happens to a poor man who gives his last coin to a beggar-in-disguise who is actually a rich baron. First published in The World newspaper in June, 1887. Unless one is wealthy there is no use in being a charming fellow. Romance is the privilege of the rich, not the profession of the unemployed. The poor should be practical and prosaic. It is better to have a permanent income than to be fascinating. These are the great truths of modern life which Hughie Erskine never realised. Poor Hughie! Intellectually, we must admit, he was not of much importance. He never said a brilliant or even an ill-natured thing in his life. But then he was wonderfully good-looking, with his crisp brown hair, his clear-cut profile, and his grey eyes. He was as popular with men as he was with women, and he had every accomplishment except that of making money. His father had bequeathed him his cavalry sword, and a History of the Peninsular War in fifteen volumes. Hughie hung the first over his looking-glass, put the second on a shelf between Ruff's Guide and Bailey's Magazine, and lived on two hundred a year that an old aunt allowed him. He had tried everything. He had gone on the Stock Exchange for six months; but what was a butterfly to do among bulls and bears? He had been a tea-merchant for a little longer, but had soon tired of pekoe and souchong. Then he had tried selling dry sherry. That did not answer; the sherry was a little too dry. Ultimately he became nothing, a delightful, ineffectual young man with a perfect profile and no profession. To make matters worse, he was in love. The girl he loved was Laura Merton, the daughter of a retired Colonel who had lost his temper and his digestion in India, and had never found either of them again. Laura adored him, and he was ready to kiss her shoe-strings. They were the handsomest couple in London, and had not a penny-piece between them. The Colonel was very fond of Hughie, but would not hear of any engagement. 'Come to me, my boy, when you have got ten thousand pounds of your own, and we will see about it,' he used to say; and Hughie looked very glum on those days, and had to go to Laura for consolation. One morning, as he was on his way to Holland Park, where the Mertons lived, he dropped in to see a great friend of his, Alan Trevor. Trevor was a painter. Indeed, few people escape that nowadays. But he was also an artist, and artists are rather rare. Personally he was a strange rough fellow, with a freckled face and a red ragged beard. However, when he took up the brush he was a real master, and his pictures were eagerly sought after. He had been very much attracted by Hughie at first, it must be acknowledged, entirely on account of his personal charm. 'The only people a painter should know,' he used to say, 'are people who are bete and beautiful, people who are an artistic pleasure to look at and an intellectual repose to talk to. Men who are dandies and women who are darlings rule the world, at least they should do so.' However, after he got to know Hughie better, he liked him quite as much for his bright buoyant spirits and his generous reckless nature, and had given him the permanent entree to his studio. When Hughie came in he found Trevor putting the finishing touches to a wonderful life-size picture of a beggar-man. The beggar himself was standing on a raised platform in a corner of the studio. He was a wizened old man, with a face like wrinkled parchment, and a most piteous expression. Over his shoulders was flung a coarse brown cloak, all tears and tatters; his thick boots were patched and cobbled, and with one hand he leant on a rough stick, while with the other he held out his battered hat for alms. 'What an amazing model!' whispered Hughie, as he shook hands with his friend. 'How much does a model get for sitting?' asked Hughie, as he found himself a comfortable seat on a divan. After some time the servant came in, and told Trevor that the frame-maker wanted to speak to him. 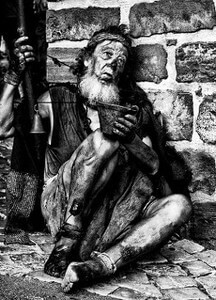 The old beggar-man took advantage of Trevor's absence to rest for a moment on a wooden bench that was behind him. He looked so forlorn and wretched that Hughie could not help pitying him, and felt in his pockets to see what money he had. All he could find was a sovereign and some coppers. 'Poor old fellow,' he thought to himself, 'he wants it more than I do, but it means no hansoms for a fortnight;' and he walked across the studio and slipped the sovereign into the beggar's hand. Then Trevor arrived, and Hughie took his leave, blushing a little at what he had done. He spent the day with Laura, got a charming scolding for his extravagance, and had to walk home. That night he strolled into the Palette Club about eleven o'clock, and found Trevor sitting by himself in the smoking-room drinking hock and seltzer. 'Well, Alan, did you get the picture finished all right?' he said, as he lit his cigarette. 'You don't mean to say you talked to him about her?' said Hughie. 'You told that old beggar all my private affairs?' cried Hughie, looking very red and angry. 'What on earth do you mean?' exclaimed Hughie. 'Baron Hausberg!' cried Hughie. 'Good heavens! I gave him a sovereign!' and he sank into an armchair the picture of dismay. 'What a duffer he must think me!' said Hughie. However, Hughie wouldn't stop, but walked home, feeling very unhappy, and leaving Alan Trevor in fits of laughter. 'I suppose he has come for an apology,' said Hughie to himself; and he told the servant to show the visitor up. 'I beg, sir, that you will offer him my sincerest apologies,' stammered Hughie. 'The Baron,' said the old gentleman, with a smile, 'has commissioned me to bring you this letter;' and he extended a sealed envelope. On the outside was written, 'A wedding present to Hugh Erskine and Laura Merton, from an old beggar,' and inside was a cheque for 10,000. When they were married Alan Trevor was the best-man, and the Baron made a speech at the wedding-breakfast. Add The Model Millionaire to your own personal library.